Lisa Jo wasn’t just born for theater, she was destined to re-imagine & direct it. The non-profit Just Act is the culmination of 28+ years as an educator, director and Theatre of the Oppressed Joker (aka. facilitator) extraordinaire. She believes there’s an artist within each of us; her approach to Theater of the Oppressed truly gives us the tools and courage to explore, deconstruct and reconstruct ourselves as change-makers and the world around us as just. Back in the 1990s, with an MA & Ph.D.from the UT Austin, she headed to Paris France where she devoted 3 years to training with Augusto Boal, Nobel Prize nominated creator of Theatre of the Oppressed, and serving as Assistant to Director Ariane Mnouchkine of the world-renowned Théâtre du Soleil. Back in the USA, after 7 years at Tulane University as Assistant Professor of Theatre in the Department of Theatre & Dance, garnering awards for teaching and directing, she returned to Philadelphia where she and husband David Brown founded Gas & Electric Arts (GEA) to stage productions by living women playwrights for which they were awarded NEA grants and a Pew plus Barrymore nominations for excellence in theatre. Theatre of the Oppressed workshops were the educational arm of GEA where people of all ages and backgrounds sought Lisa Jo’s masterful direction to explore issues of identity & empowerment, community and social justice. 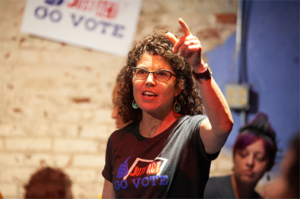 With oodles of street cred leading theatre-based community engagement projects and countless TO workshops and programs, Lisa Jo founded Just Act in 2015 as a catalyst for change and activism to build a just and thriving world. With Just Act, a distinctive hybrid of artistic and community engagement, Lisa Jo develops and refreshes the capacity of social change makers and seekers to stand up for justice with renewed compassion and emboldened courage to face challenges. Working at the intersection of theatre, social justice, anti-oppression facilitation and creative community engagement. Lisa Jo integrates her multi-dimensional skills into facilitation and teaching of Theatre of the Oppressed, social justice diversity training, education and facilitation of inter-group dialogue; arts and asset-based community engagement and planning; organizational and individual capacity development, engagement, expression and activism.